When people walk into Renown Health, they are welcomed with brightly colored walls, music and art. Dr. Tony Slonim, Renown’s president and CEO, talks about importance of healing environment in his CEO Blog. It is an unfortunate paradox that many older healthcare facilities are anything but hospitable. For years, facilities were developed with caregivers’ needs in mind rather than patients’. As a result, many of those dated facilities are cold, sterile environments rather than soothing spaces that speak to patients’ emotional and spiritual health. It’s also worth noting that those facilities weren’t always the best workplace environments for employees either. Fortunately, there is now growing acceptance of the enormous impact our environment has on health and well-being. 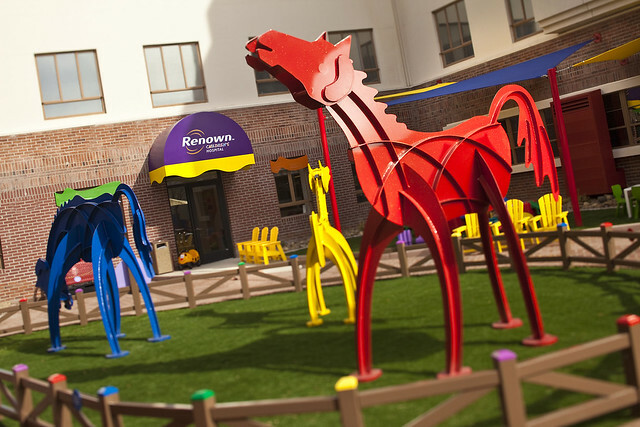 At Renown Health, we understand the importance of creating an environment of healing and restoration for our patients and visitors. We want to be a center for total health, offering outstanding clinical care in addition to more comprehensive, holistic ways of healing. When people walk into Renown Health, they are welcomed with brightly colored walls, music and art. We have designed healing gardens for adults and children to enjoy as they reflect amongst nature. We provide shops and restaurants to give people a sense of familiarity and normalcy while they are in a medical center. By adding these elements and spaces to our medical center, Renown Health hopes to create a healing and healthy environment for our patients, family members, visitors and employees. Next articleHow Do I Prepare for Surgery?